White lights strung on tree-lined streets, garish decorations in store windows, and jolly winter wonderland Starbucks cups: it’s the holidays. At this time of year, we tend to cling to tradition, plan elaborate family dinners, and devise strategies for not sitting next to ______. As is true with most holiday feasts, the dessert table is a pie lover’s dream come true— warm apple pie, spice-kissed pumpkin, crunchy pecan, and perhaps even sweet potato pie. Yet, there is one lonely and forgotten pie that seems to be missing from the holiday dessert menu: mincemeat. This pie has a long and glorious history, but due to its unfortunate name and some influential dissenters, mincemeat pie has slowly fallen out of favor. The humble goal of this article is to reverse that trend: it’s time mincemeat got the respect it deserves. I know most of you are asking what is in this strange sounding pie. Let’s start with the word “mince.” Mince is derived from the Latin minutia, meaning ‘smallness’, and minuere, meaning ‘to reduce or diminish.’ Over time “mince” became aligned with the word “meat” to mean ‘finely chopped meat’. Mincemeat pie bursts with flavors that evoke a distant past. The dark and dense filling is extravagant: tart apples, dried fruits, tangy citrus zest, potent brandy, all warmed by spices and made incredibly rich with the addition of meat or simply suet. Suet is the fat that surrounds the kidneys, prized by many pastry chefs, however most contemporary recipes don’t call for it. Mince pies, as they are called in England (where they still hold a place of honor) originated when the Crusaders returned from the Holy Land bearing unfamiliar spices: cinnamon, nutmeg, and cloves. At this time, the sweet-savory flavor combinations from the Near East became all the rage in England. One of the earliest known types of mincemeat pies was a small medieval pastry called a chewette, which contained chopped liver mixed with chopped hard-boiled egg and ginger and was either baked or fried, according to the Oxford Companion to Food. Mince pie was a darling of Elizabethan feasts. The dessert’s extravagant spices made it a centerpiece of the main meal, especially around Christmas. Early versions of mincemeat pies were not round but instead baked in an oblong shape to symbolize Christ’s manger. The pie’s myriad spices represented the gifts brought by the Magi. But mincemeat’s heyday was short-lived. The moment Oliver Cromwell, a staunch Puritan, assumed the title Lord Protector of England, Scotland, and Ireland in 1653 he called for a ban on mince pies. This prohibition was just part of the Puritan-led Parliament’s rules barring anything connected with Christmas feasting and it was the start of hard times for mincemeat. English Puritans carried their disdain for mincemeat across the Atlantic to Plymouth. As time passed though, the hard New England winters wore down the strictest of Puritan tenants, and mincemeat emerged from the ashes as a sustaining force. Mincemeat’s heartiness and ability to be preserved enabled it to act as comfort food during the long, cold months. Soon it again held center stage alongside the Christmas roast. By the 19th century, both the mince pies and the mince filling could be purchased in local markets. The Astor recipe, like many from the 16th century onward, was designed to make a large supply of mincemeat. Alcohol, usually brandy or rum, served as a way to preserve the filling so that it could be used as a condiment or dessert all year round. Mincemeat was back on top. How did we go from a nation where a good mincemeat pie was a point of pride to one where hardly a soul has tasted it? In the 19th century, as many were reveling in the deliciousness of the pie, others were pointing out the downfalls of its unabashed richness. When, in 1863, Sarah Hale, an American writer (who penned Mary Had a Little Lamb), urged President Abraham Lincoln to make Thanksgiving a national holiday, she also suggested that mincemeat pie be eaten only during holidays. Apparently she had a personal issue with the digestibility of the pie. 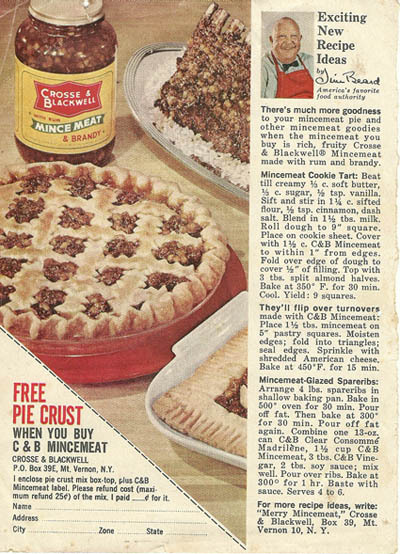 The crusade against mincemeat continued when, in 1884, the New York Times ran a piece on the secularization of mincemeat pie that began “the deadly character of mince pie is notorious, and its widespread use is unquestionably one of the great evils of the age.” The article argued that mincemeat pie, once a part of Christian ceremony, had lost “its religious character” and now, “all over the civilized world we find the degraded victims of mince pie eagerly swallowing their fearfully miscellaneous poison.” Really now, it’s just a pie! Perhaps as a concession, many of mincemeat recipes started to replace meat with just suet or got rid of the animal products all together and the proportions of fruit and liquor increased. But traditional recipes can still be found and some still include suet on the ingredient list. The British, diehard fans of mincemeat, can always be counted on for solid mincemeat pie recipes. Jamie Oliver and Gordon Ramsay never fail to include mince pies as part of their Christmas feasts. Occasionally, Bon Appetite will include a recipe, but it always seems like an afterthought, and Saveur Magazine ran an article on mincemeat in December, 2008. In my quest to find the perfect mince pie. I have tried many recipes. One feature you will notice is that no two are alike. I find this simultaneously liberating and infuriating. Mince pie affords the freedom for self-expression, but it’s also easy to make an error in judgment. Cut the apples too small and the filling will be mushy; add too many raisins and it will feel like you just ate a brick; too heavy a hand with the spices and you might as well feed it to the birds. Below is the traditional Astor Family recipe for mincemeat pie and beneath that one is my own recipe. It has been improved over many attempts, and is a lighter version than the original: brightly flavored, full of fresh and dried fruits with just a dash of brandy for old time’s sake. When you bake this pie you will be tapping into a tradition nearly 1,000 years old and joining mincemeat on its roller-coaster ride through history. Combine the flour and salt with a whisk or fork. Work the butter into the flour mixture with two knives until the dough resembles course sand. Don’t make it too smooth, good pie dough starts out lumpy. Use your hands to incorporate the mixture and create a uniform dough. Add ice water a tablespoon at a time until the dough comes together. Separate the dough into two equal size discs. Place each in plastic wrap and refrigerate for at least 30 minutes. This allows the gluten to relax. Combine apples, dried fruits, sugar, spices, and cider in a saucepan over medium heat. Simmer, covered, just until the apples start to soften, about 15 to 20 minutes. Remove the lid and let the liquid mostly evaporate, about three minutes. Add pecans, vanilla, zest, and brandy. Stir and set aside to cool. Roll out one of the dough discs in between two pieces of plastic wrap. A cold marble rolling pin works best, but a wooden one stored in the freezer will do. Roll, starting in the middle and moving toward the edges, until it will fit into your pie plate. Place bottom crust into the pie plate. Add the cooled filling to the prepared pie plate. Roll out the second disc to cover the filling. Seal the edges of the crust by pinching with your fingers or using a fork. This keeps the filling from escaping. Brush the top crust with the glaze. Bake for about 45 minutes, or until golden brown on top.